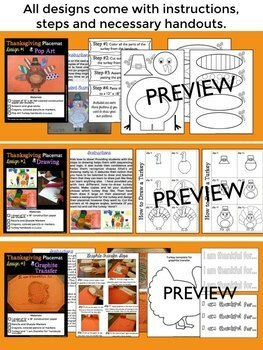 Thanksgiving Activities BUNDLE: Great Thanksgiving Crafts! 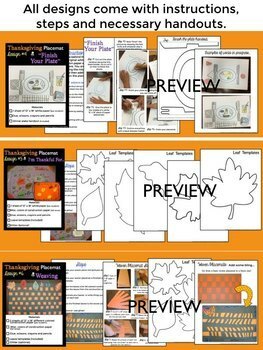 Thanksgiving placemat (craftivity) for classroom teachers makes a really fun and meaningful Thanksgiving craft in your classroom! 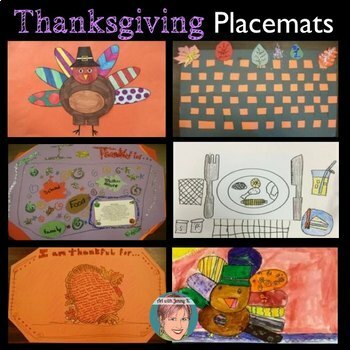 In this unit you will get 6 different ways to make placemats with your students (plus a variation to one of the designs). I have included images and handouts to save you as much time as possible. You can choose which designs you like and what works best for the age group you are working with. You could also decide to let the kids pick which one they would like to make. If you have access to a school laminator and can laminate them when they are finished--then you can make them reusable! At the end of this packet I give you the handouts all together in one place to make printing easier. You can project the steps and images onto your white board to save printing in color. This Thanksgiving activity is part of my Thanksgiving/November Activities Bundle.This resource is also part of my Holiday Themed Activities BUNDLE for the entire year! Please see the preview for more details! 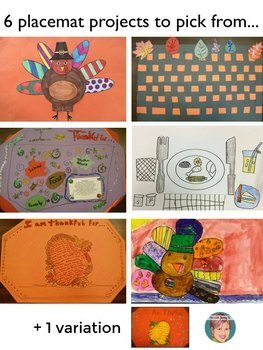 When we made these placemats at my school we were making them for the Salvation Army to use during their annual Thanksgiving dinner. Every student in my school, kindergarten to fifth grade, made a placemat and we donated almost 600 of them to the Salvation Army to use with their Thanksgiving meal that year. I developed a variety of lessons, some geared to younger students and some to older ones. It was a great community project and I encourage you to do the same. It means a lot to the kids to be able to give something of their to others! Please download my preview to see exactly what you will get with this unit. © Copyright 2014 Art with Jenny K. ® ALL RIGHTS RESERVED. Permission is granted to copy pages specifically designed for student or teacher use by original purchaser or licensee. The reproduction of any part of this product is strictly prohibited. Copying any part of this product and/or placing it on the internet in any form (even a personal/classroom website) is strictly forbidden. Doing so is a violation of the Digital Millennium Copyright Act (DMCA). Purchase extra licenses for others to use this resource discounted.